Chemotherapy is the treatment of cancer with drugs. It can be used to cure cancer, control cancer, and/or relieve the symptoms that cancer may cause. Chemotherapy may be given through your veins and/or by mouth. Chemotherapy drugs destroy cancer cells by stopping them from growing or reproducing. At the same time healthy cells can be harmed, especially those cells that reproduce rapidly, causing side effects. Typically these healthy cells repair themselves after the chemotherapy is complete. The Outpatient Services Department at Clarke County Hospital can administer Chemotherapy treatments to patients by referral of their physician or by appointment. Clarke County Hospital is very proud to offer this service to patients in the community; reducing the need to travel far from home for treatment. Our goal is to make sure that your treatment is as comfortable as possible. 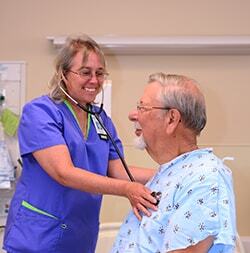 For a complete list of Infusion Services offered at Clarke County Hospital click here.